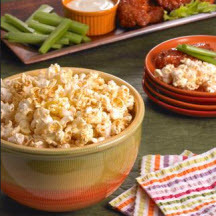 Add a kick of spicy flavor to plain popcorn with this ranch-style seasoning mix. In a small bowl, blend ranch dressing mix, spice mix, garlic powder, powdered sugar and cayenne pepper. Sprinkle with vegetable oil and blend until well incorporated. Place popcorn in a serving bowl and spray lightly with cooking spray. Sprinkle seasoning mix over popcorn to taste and toss. Store leftover seasoning mix in an airtight container for future use. Makes about 2 tablespoons seasoning mix. Recipe and photograph provided courtesy of The Popcorn Board.